Berlioz foresaw himself enjoying the sweets of his artistic labours—if only he could live to be a hundred and forty.1 He foresaw appreciation, that is to say, in the 1940’s. That time is now not far off. If Berlioz were surviving to-day it is possible that he might feel that the charming 1940’s were not worth waiting for, in the face of a still embittered lot and a world still hostile and ingrate. Would life for him have been at all tolerable in the midst of present-day music—for him who more than eighty years [ago?] was exclaiming2 against musicians whose taste for excessive modulations and dissonances was like that of ‘certain animals for the thistle’? On the other hand, he might have been gratified by certain signs and omens—by the fascination which his personality has never failed to exercise even where his art is not loved, and by the veritable passion felt for that art by some of the most considerable men of the 1920’s— Weingartner, Beecham, and Harty among the conductors, and among the critics Ernest Newman, Cecil Gray, W. J. Turner,3 and Romain Rolland. 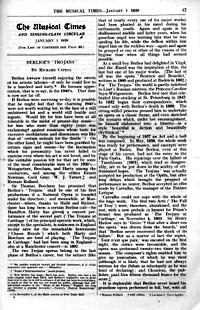 Sir Thomas Beecham has promised that Berlioz’s ‘Trojans’ shall be one of his first productions if a National Opera is founded under his direction; and meanwhile, at Manchester—where, thanks to Hallé and Richter, there has long been a certain Berlioz cult—Sir Hamilton Harty has given4 a concert performance of the second part (‘The Trojans at Carthage’) of his principal operatic work, which, except to the specialists, is unknown in England to-day save for the remarkable Intermezzo (‘Chasse Royale’) which both Harty and Beecham are fond of playing. ‘The Trojans at Carthage’ had last been sung in England—also at a Manchester concert—in 1897. The two Trojan operas belong to the last phase of Berlioz’s career, but the subject (like that of nearly every one of his major works) had been planted in his mind during his enthusiastic youth. Again and again in his disillusioned middle and latter years, when his guardian angel was warning him that he was spoiling his life, while the demon within him urged him on the reckless way—again and again he grasped at one or other of the visions of the bygone time when all things had seemed possible. By the beginning of 1857 an Act and a half was composed. In May, 1858, the whole work was ready for performance, and excerpts were played at Baden. But Berlioz, even at this stage of his career, had not the entry to the Paris Opéra. His rejoicings over the failure of ‘Tannhäuser’ (1861), which read so disagreeably, are to be put down to the acidity of oft-frustrated hopes. ‘The Trojans’ was actually accepted for production at the Opéra, but after long delays which brought the prospect of performance no nearer, Berlioz accepted an offer made by Carvalho, the manager of the Théâtre Lyrique. ‘He was not, as some would have it, killed by the injustice of men, but by a gastric complaint caused by his obstinate disregard of medical advice and of an hygienic regimen. ‘The Trojans,’ as now published, consists of two operas, although as performed at the Paris Opéra it is (by large excisions) reduced to one evening’s entertainment. In Choudens’s edition ‘The Fall of Troy’ is in three Acts and ‘The Trojans at Carthage’ in four. The former was first produced at Karlsruhe in 1890, under Mottl. In the first scene, the Trojan people are disporting themselves after ten years of siege, on the site of the Greek camp. Some simply delight to breathe the air of peace and freedom again; others collect relicts—helmets and javelins—of the departed enemy. In their ignorance they wonder at the monstrous wooden horse left behind by the Greeks. Only Cassandra is tormented by apprehension. She implores Chorœbus, her betrothed, to flee from Priam’s doomed kingdom, but he fondly scorns the warning. The second Act begins with a Trojan march and hymn in celebration of peace. The rejoicings are overclouded by the appearance of the widowed Andromache and Astyanax in mourning. The note of tragedy is reinforced by Æneas’s sudden arrival with the tale of Laocoon’s fate in the grip of the miraculous serpents. This portent is read as a divine injunction to the Trojans to take the horse within their walls as an object of worship. Cassandra’s frantic warnings pass unheeded. The third Act opens in Æneas’s tent. To him in sleep appears Hector’s ghost to announce the entrance of the Greeks, their victory, and the burning of the city. Æneas must, says the spectral voice, flee with his son and followers to found in a distant land a new Troy. The news of Troy’s ruin is confirmed to the now awakened Æneas by the priest Pantheus, by Chorœbus, by Æneas’s son Ascanius, and defeated soldiers. The scene changes to the temple of Vesta-Cybele, where the despairing women of Troy have sought shelter. Without, the city burns. To them Cassandra announces that Æneas has saved Priam’s treasure and has retreated in safety; but Chorœbus is dead and she desires life no longer. She stabs herself, as do the rest of the women, just as the Greeks rush into the temple. In the first Act of ‘The Trojans at Carthage’ we learn that the widowed Dido has rejected the suit of Iarbas, King of Numidia, and intends to devote herself to the memory of her dead husband. The wandering Trojans are announced and are hospitably received. Then comes news of affronted Numidia’s declaration of war. Æneas reveals himself and volunteers to lead the Carthaginian forces. The famous Intermezzo here occurs. Then in Act 3 we hear from Pantheus of Æneas’s decision to obey the supernatural summons. The common soldiers are well satisfied with Carthage, but the spirits of the dead Trojans leave their leader no peace. In the fourth Act Dido realises that she has lost her lover. After an access of rage, despair seizes her. She determines to die. Her funeral pyre is built on the sea-shore. There she stabs herself and dies, but not before foreseeing the secular enmity between Rome and Carthage and—the last horror of her agony—the final destruction of her city. The stage picture at the end shows us above Dido’s pyre—before which her mourning people vow eternal hatred of Æneas and his race—a vision of the Roman Capitol in all its glory. Can the value of this vast scheme be appraised? The Manchester performance, brilliant though it was, only made it clear that ‘The Trojans’ is not concert music. Sir Thomas Beecham said once that some music has not merely a different effect but is felt to be of a totally different nature and essence when heard in association with dramatic action and spectacle. To us in England, brought up as we all have been on the German classics, Berlioz’s music is a baffling phenomenon. The poverty of so many of the ideas and of so much of the texture! Looking at the pianoforte score of ‘The Trojans’ many a man would say that it was negligible music. And yet in practice Berlioz is found to be a charmer, unless one is accessible to nothing but German musical syntax. At its least interesting this music sounds better than it looks—sounds more bright and clear. At its best it sounds unpredictably different. Berlioz’s art in placing a note or chord (with its associated—its indissociable—instrumental timbre) fascinates the ear. This poetry of sound makes itself felt again and again in ‘The Trojans.’ One example is in the septet, ‘Tout n’est que paix,’ Act 2—in the deep, occasional, and pianissimo chords of the bass strings and bass-drum beneath the light accompaniment of flutes, clarinets, and horns. Dido’s entrance and the scene of the apparitions contain other examples. In the Intermezzo these Berliozian flashes come thick and fast. Every concertgoer, though he has not heard ‘The Trojans,’ will know what is meant if he casts his thoughts back to the slow movement of the ‘Fantastic’ Symphony. The flashes are nevertheless not numerous enough always to sustain the interest in a concert performance of ‘The Trojans.’ It is possibly the listener’s fault. Without being quite as stupid as Mr. Gray holds him to be,10 the ordinary listener asks, perhaps unreasonably, from every music the sustained explanatory conduct of the German masters. The rehearsed, cogent, adequate speech—that is the classic music we know. Berlioz gives hints of another sort of music, one of intuition and the sudden blow of wit, the moment’s invention for the moment’s need. But has he shown that such a music can be sustained? There are brilliantly rhythmical movements in Berlioz. There are the ‘flashes’ which are comparable with the surprising illumination of one of Shakespeare’s daring words. There are also, in ‘The Trojans,’ stretches of dull writing. Berlioz is exciting when himself excited, but then there is a drop, and it becomes hard to see any interest in his ordinary style. ‘He had a natural gift of style,’ says Rolland11 —but the reference is to Berlioz’s prose. Precisely that gift is what his music is felt to lack. In his fiery moments he engendered the modern Russian school. But in the intervals between his inspirations there is a remplissage. It is as though Berlioz had absented himself, so uncharacteristic is the phraseology. The father of Balakirev and Rimsky-Korsakov falls back on turns of phrase suggestive of Gluck and early Beethoven. Mr. Bonavia, in his critique of ‘The Trojans,’ connected a drop in the musical interest with Berlioz’s lack of interest in certain characters—in Anna and Æneas. But when Wagner found a personage like Fricka on his hands—a dreary but necessary personage who inspired him with no characteristic phrase—he could lend her from his general vocabulary resources that maintained her handsomely. Mr. Gray surely goes rather far when he says, ‘He [Berlioz] owes nothing to any predecessors’; but it is true that there was all too little to borrow. The French romantic poets refreshed their language at 17th-century and older sources, but Berlioz could find no corresponding spring. Fancy suggests that he might have remained at St. Petersburg and become the most brilliant Russian of them all. The sailor’s song at the beginning of the third Act of ‘The Trojans’ might, sung in Russian, easily be taken for Glinka, or even Moussorgsky. But all these remarks are fancies—so much was admitted above in the confession that ‘The Trojans’ has still to be seen in England as an opera. The stage may make all the difference. We know from ‘Lontano, lontano!’ in Boïto’s ‘Mefistofele’ what a poetry can reside in a music which would appear jejune as a concert piece. So may the duet ‘Nuit d’ivresse’ in Act 2 of ‘The Trojans’ escape from the seeming monotony of its hundred and twenty bars of regular 6-8 time. One word of warning before the Imperial League of Opera stages ‘The Trojans’: the English version used at Manchester will not do at all. 3. ‘Now Berlioz has magic, Bach has none. Berlioz also had a far more original mind than Bach, and Berlioz’s originality was so great that even to-day he is still in advance of all that has been invented since, so much so that he has not yet found his public, although that self-advertised creator of the “Music of the Future,” Wagner, has long ago become a popular favourite’—Turner’s ‘Musical Meanderings’ (1928). 4. On November 1, at the Halls concert at Free Trade Hall. 10. He says that the low level of his dynamic intensity is ‘one of the main reasons of Berlioz’s unpopularity with the multitude. Most of them feel that they are not getting their money’s worth if the whole orchestra, and the organ as well, are not kept blaring away most of the time’—C. Gray’s ‘History of Music,’ p. 215. 12. Henri Radiguet, ‘La Musique Française de 1789 à 1815’ (Lavignac). 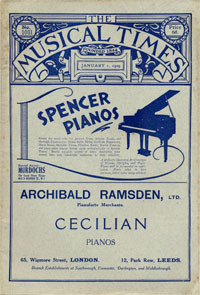 * We have transcribed the text of this article from the 1 January 1929 issue of The Musical Times, a copy of which is in our collection. We have not been able to contact the descendants of the late Richard Capell.